Large group of Religious Zionist rabbis from across spectrum ask Prime Minister to establish a synagogue on the Temple Mount. A wide ranging group of rabbis from the National Religious camp have written a letter to Prime Minister Binyamin Netanyahu advocating the construction of a synagogue on the Temple Mount, Judaism's holiest site. Among the rabbis are those considered religiously “conservative” and who have avoided making public calls for prayers on the Temple Mount until now – including Rabbi Shmuel Eliyahu – as well as those considered more “liberal,” including Rabbi Shlomo Riskin, Rabbi She'ar Yashuv-Cohen, Rabbi Menachem Borstein, and Rabbi Daniel Shilo. Many of the latter have also avoided calling for prayers on the Mount as well. Also signing the letter were prominent Religious Zionist figures Rabbi Dov Lior, Rabbi Eliyahu Zinni, and Rabbi Haim Cohen. The letter was also signed by many professors, educators, and professionals; it was authored and delivered by the Amutat Yishai organization, which advocates building a synagogue on an area of the Temple Mount that many rabbis agree Jews are allowed to ascend to. While much of the Temple Mount is off-limits to Jews today because of issues surrounding ritual impurity, many rabbis agree with the assessment of historians that some areas of the Mount were not included in the boundaries of the Holy Temple area, and as such, Jews should be allowed to visit them, even in a state of ritual impurity - though only after ritual immersion and other measures. Jews who visit the Mount today venture only into those areas, and the letter advocates building a structure in that area where Jews can pray. The Chief Rabbinate, as well as most hareidi rabbis, are opposed to ascending the Mount altogether, out of fear that those who ascend will mistakenly enter the forbidden areas. The fiercest opposition to the proposal in the past has come from Muslim authorities and Islamist groups, most notably the Islamic Waqf authority which administers the site. 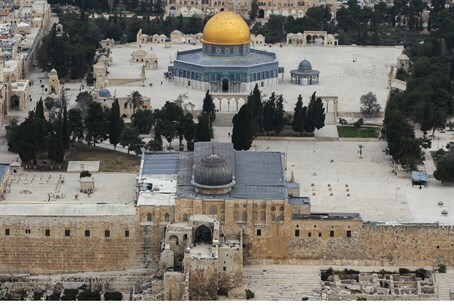 Muslim extremists regularly issue threats against Jewish visits to the Mount, and Jews are forbidden from praying at their holiest site by authorities in order to avoid offending Muslim sensibilities in the Al Aqsa Mosque complex. Late last year a bill was tabled pushing for equal prayer rights for Jews on the Temple Mount - sparking fury from Muslim MKs.